11 September 2013, at 12:00a.m. Slow, low stress handling and keeping hogs cool during loading and transport continue to be the most practical recommendation for reducing transport deaths. These are the conclusions of Kathy Zurbrigg and Tony van Dreumel following research reported in the Prairie Swine Centre Annual Report for 2012-2013. A total of 75 hogs - 65 in-transit deaths (ITD) and 10 recumbent hogs that were euthanised prior to unloading at the plant - had a post mortem completed to determine their cause of death between May 2012 and February 2013. Cardiac abnormalities associated with heart failure were the most consistent pathology found in 61 of the 75 hogs that died in-transit (81 per cent). It was apparent that the heart defects were present for weeks to months prior to the death of the pig. Less than 20 per cent (14/75) of the market hogs that died in transit had lesion-free hearts. Frequently, the only finding in hogs without heart lesions was pulmonary congestion and oedema, which can be an indicator of death by heat stress or asphyxiation as well as cardiac failure. Cardiac abnormalities were not always visible on gross examination but were identified on microscopic examination. The ITD hog hearts were compared to non-ITD hog hearts. A random sample of 51 non-ITD hearts was collected from the processing line at the slaughter plants to serve as a control group for heart abnormalities. All of these hearts appeared normal on visual inspection but 45 per cent (23/51) of the non-ITD hearts had microscopic heart lesions of the same type but not the same severity as found in the hearts of hogs that died in transit. The visible lesions found in the ITD hearts and the microscopic lesions found in both the ITD and non-ITD hearts are similar to the lesions found in people with a disease called hypertrophic cardiomyopathy (HCM). HCM is a genetic heart disease recognised in humans, and some breeds of cats and dogs, which can cause sudden death. 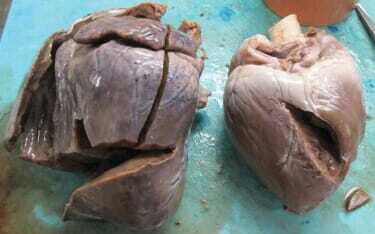 Compared to all other species (including humans), a pig’s heart is small in relation to its body size (1). As a result, pig hearts are working at close to their maximum output during normal daily activities. Therefore, there is little reserve when the need arises to pump more blood such as when physical demands increase. When the heart is abnormal, there is even less reserve capacity to respond to challenges. When an abnormal heart is challenged with any type of stress, e.g. fighting, being restrained or being loaded or unloaded onto a truck, the heart is often unable to compensate further and heart failure occurs. Even though heart lesions were present in non-ITD hogs, they were only found at the microscopic level and were not considered severe enough to cause heart failure. Statistical analyses demonstrated a significant relationship between the hogs that died in transit and the presence of visible heart lesions. Analyses also demonstrated that the average annual rate of in-transit loss was higher for producers where gross (visual) heart lesions were identified in the hog hearts. All of the hearts were weighed. The total and sectioned heart weights were heavier for hogs that died in transit in comparison to the control hearts from the processing line. Hearts with abnormalities work harder to compensate for their defects (2). Because the heart is a muscle, this increased work load results in the heart muscle becoming larger and more dense. Increased heart weights are one method used to confirm that a cardiac abnormality was serious enough to result in an increased work load or stress over an extended period of time. The fact that the average heart weight of ITD hogs was significantly heavier than non-ITD heart weights supports the diagnosis of heart failure as the cause of death. The affected hearts were enlarged indicating a response to the persistent increased work loads that are associated with cardiac disease (Figure 1). An additional 16 hogs died and were examined during cool-cold weather, between October 2012 and February 2013. All 16 of those hogs died due to heart failure from a pre-existing heart lesion with 14/16 (88 per cent) having HCM-like lesions. Due to the increased rate of ITD hogs during warm weather, the cause of death has traditionally been assumed to be heat stress. The majority of ITD hogs examined in this study died of heart failure due to pre-existing heart lesions, regardless of the temperature. While the cause of in-transit death loss is not often heat stress, outside temperature is associated with heart failure in ITD hogs. Increased temperatures can increase the heart rate, sometimes as much as twice the normal rate. The strength of heart contractions may also be enhanced by temperature increases (3). If a hog’s heart is defective and is enlarged, the increased heart rate or strength of contraction caused by elevated temperatures during transport in warm weather, in combination with the exertion of transport, can cause the heart to fail. During the colder weather, hogs with heart lesions do not have the added risk factor of heat increasing the workload on the heart and this may explain why there are fewer ITDs in the fall and winter. Current transportation practices are likely appropriate for the vast majority of healthy market swine. Many of the current transport losses including downer animals that must be euthanised on the truck, may be eliminated if efforts are directed in part at improving the heart health status of pigs prior to market. This may lead to additional benefits for producers including a reduction of sudden death losses of finishing hogs on the farm. Further research is needed to identify factors associated with heart lesions in hogs. Most hogs with heart defects appear healthy and rarely express clinical signs prior to death. Hogs that become recumbent with blotchy skin and are open-mouth breathing may have cardiac defects. Producers should mark these hogs and load them with extra care preferably in a compartment by themselves. At this time, slow, low-stress handling and keeping hogs cool during loading and transport continues to be the most practical recommendations for reducing transport deaths. 1) Friendship, R., Henry, S. 1998. Cardiovascular system, haematology and clinical chemistry. In Diseases of Swine.7th Ed. Chapter 1 pg 3-5. 2) Blood, DC., Radostits, OM. 1990. Veterinary Medicine 7th.ed. A textbook of the diseases of cattle, sheep, pigs, goats.and horses. Bailliere-Tindall Publishing. Pg 301. 3) Guyton, A., Hall, J. 2000. Textbook of Medical Physiology..10th ed. WB Saunders Co. Pg 106. Funding for this research project was provided by Ontario Pork. This project could not have been completed without the cooperation and assistance of the management and staff of both abattoirs.